The pattern is easily adjustable to accommodate your yardage. 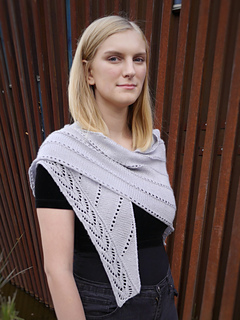 Most of the knitting of this streamlined piece is easy stockinette stitch, so you can meditate or multi-task as you knit. Knitter’s choice! 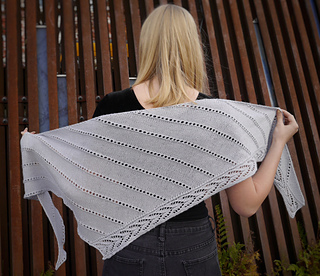 Gray shawlette shown with 550 yards Lane Borgosesia Bollicina (sadly discontinued, cashmere and silk). 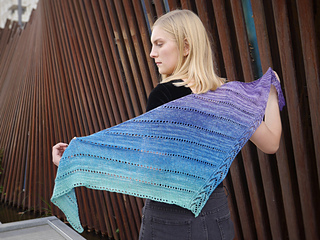 Gradient shawlette shown used 460 yard skein of Canon Hand Dyes William. Blue-green shawlette shown used 480 yard skein of Fiber Seed Sprout. 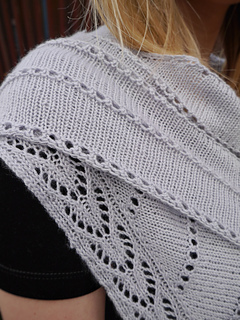 More yarn means more shawlette to snuggle up in! 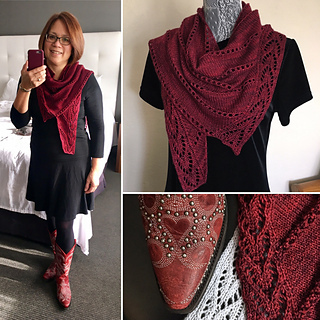 Red shawlette is Knit with Hazel Knits Entice MCN, to match my boots. The cashmere in the yarn makes it especially lovely to wear. 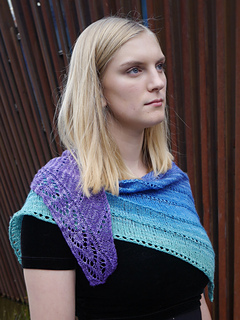 Thanks to tech editor Amanda Woodruff, and test knitters Ann Berg and Rachel Nichols.